DTH service provider Reliance BIG TV announced Monday that it had tied hands with India Post offices across Maharashtra and Goa for consumers to do the initial booking of “HD-HVEC” set-top boxes. “The effectively free HD HEVC Set-Top Boxes, as promised by Reliance Big TV, can now be booked through 12,000 India Post Offices across Maharashtra and Goa,” the company said in a statement. 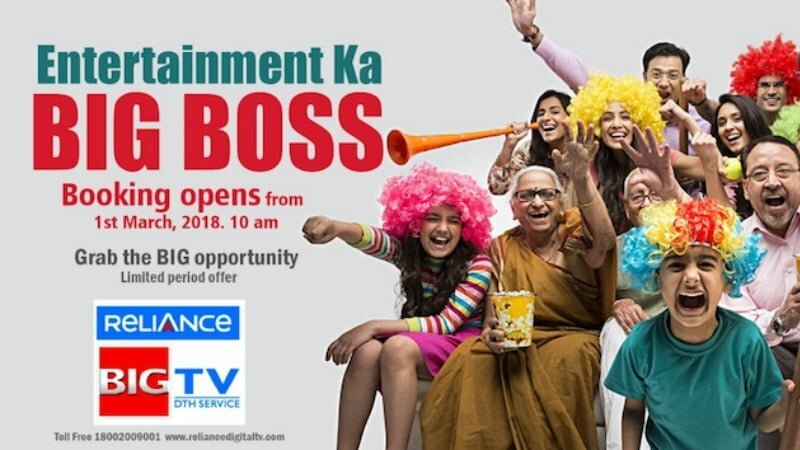 Reliance Big TV recently launched a new promo offer of free access to wide range of HD channels for one year and up to 500 free-to-air (FTA) channels for five years across the country, which we reported very recently. The pre-bookings for this initially commenced on March 1 via Reliance Digital TV’s official website. Now the customers in Maharashtra and Goa also have the option to prebook the setup box through post offices. Under this partnership, the new set-top boxes can be booked through 12,000 post offices across the two states by making an initial payment of Rs 499. Delivery will commence after 30-45 days from the date of booking. “India post has an incredible reach, which is unrivalled by any other logistics partner and the same would help the customers to book this incredible offer by paying Rs 500 at any of the post offices in Maharashtra and Goa,” Vijender Singh, Director, Reliance Big TV said. The company further stated that customers have to pay an additional amount of Rs 1,500 and Rs 250 (installation charges) at the time of the delivery to avail free DTH services for one year. The new “HD HEVC Set-Top-Box” by Reliance now comes packed with latest features, such as scheduled recording, USB port, YouTube, recording & viewing channels simultaneously. I also booked 2 reliance big TV connections on 1 March 2018, but haven’t heard from them since then. Now they don’t even answer the call. It’s a pity. After all it’s not Mukesh Ambani’s Reliance. please don’t book RDTV they are fraud.i book my connection on 01/03/2018 but till now i don’t get my connection.and the maximum installation time is 45 days.and no one pick the customer care number.